Create a stunning feature wall with these metal effect confetti hearts wall stickers. Nutmeg's beautifully designed wall stickers are a stylish, modern way to decorate a room or carry out a room makeover, without the mess. 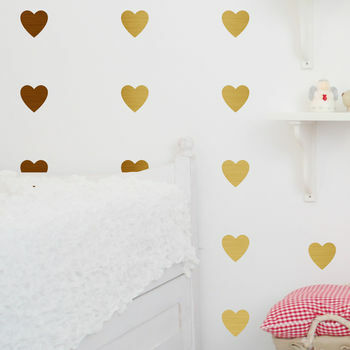 Simple instructions are provided to apply your wall sticker - each decal is easy to apply and remove. Precision cut and made from high quality brushed meteal effect vinyl.